UK Stamping supremo, Caz has come up with this storage idea for unmounted stamps. 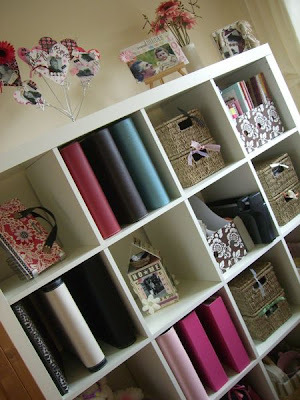 "Here is a storage solution for my magnolia stamps. CD case, I cut plastic dividers into 11cm x 11cm squares and stick my either Ez mounted stamps or stamps with tack it over and over glue onto it." You can check her work in here. Over at Ukscrappers there was an interesting thread about storing chipboard alphabets and this photos caught my attention. The letters are in this ArtBin Super Satchel Slim 6 Compartments cases which allows you to carry them anywhere. 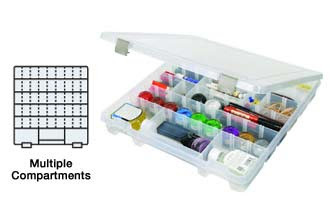 They come with 8 fixed compartments and 20 removable dividers. You can buy them here or here(UK). 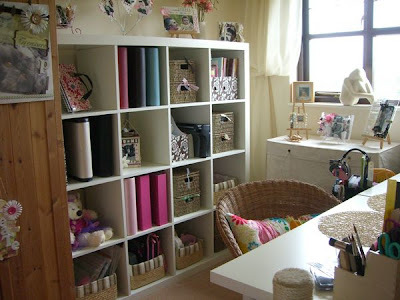 * Rebecca is the owner of Rebeccas Scrapbooking Stash (UK). I saw something like this for sale and asked DH if he could help ME make something like it!!!!!. So off we went to get the bits and this is what it we both ended up with. Not bad for no more than $2, the wood cost 29 cents a piece and the dowels were 15 cents each. 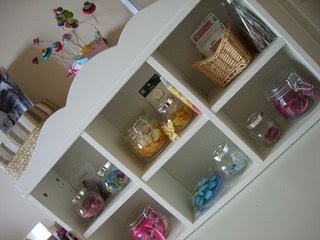 I am thrilled to bits with it, now I can see all my ribbons to hand instead of having them away in boxes or drawers. The only problem is I NEED MORE RIBBONS! You can read more about her in her blog here. 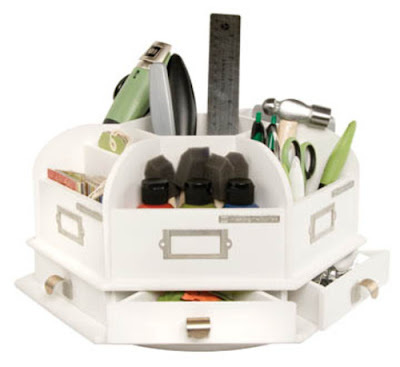 I have to admit that the only two reasons why I would like to live in the US are the price of all thing crafty and the amazing storage products available everywhere. While I was visiting Toronto last week I saw this fantastic cart. 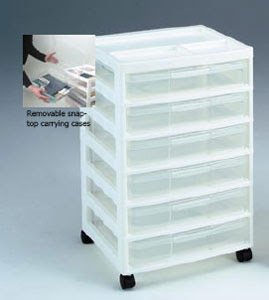 What it's great and different from others is that each drawer is a carrying case, like the one below, which is very convenient for demonstrators or scrapbookers on the go. You can buy them here (US based shop, not sure if they ship to UK). 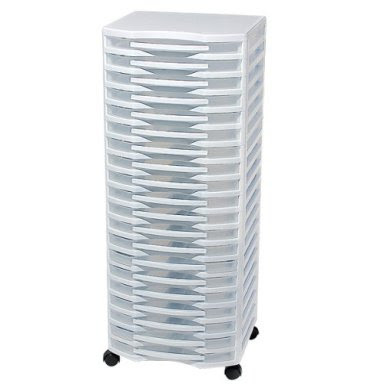 This new portable ribbon storage from Your Pictured Memor-EZ stores over 200 ribbons! Not bad! If you would like more info go here. 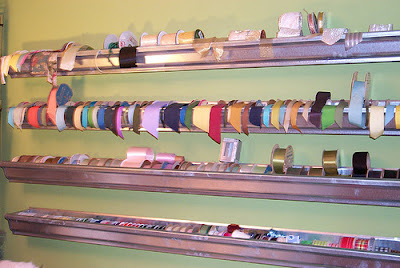 Maybe using gutters as a storage for ribbons spool is not a new idea, but it is a good one non the less and a great reminder of how great it can look and how practical it is. I really recommend to have a look in flickr for her stuff, studio and all. I decided to revamp my craft room mainly because I was running out of display space and it also gave me the opportunity to make things more accessible at the same time. 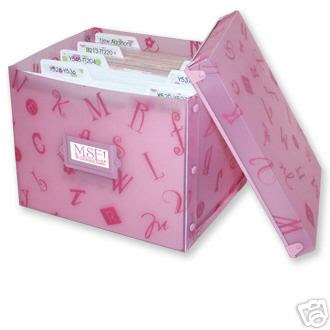 My stamps are currently in a basket but I have just bought a My Sentiments Exactly stamp storage box – Im a sucker for pink and it only worked out at £10 delivered from eBay US so I couldn’t resist!!! 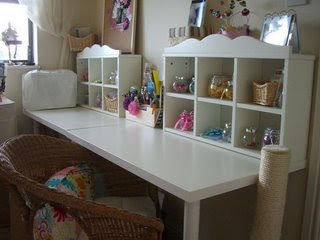 On the right of my craft room I have my 2m long desk (infact 2 desks pushed together) from Ikea – a bargain at £14 each!!! And my cute storage units on top. I was told about these wonderful spice and sweetie jars they have in Ikea so off I trundled….the spice jars are 3 for £1.99 and the large sweetie jars were 99p each but I still need a couple more! 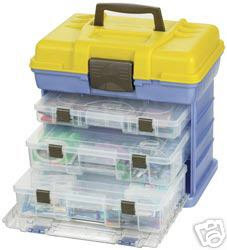 My ultimate storage item has to be my tote-ally cool tote which is jam packed with all of my tools – my life depends on this LMAO. You can find Becki's work here. Because when you go to get something that is under £10, you spend £100. Not quite, but Bex literally went in to get the spice jars everyone recommended and came out with 2 units as well so £2 turned into £60. But doesn't her studio look gorgeous? More on Bex studio later on! Angela Urbano is the proud owner of Urban Scrapyard a Toronto based scrapbooking shop with loads of style and design. Angela is also a Design Team for Quickutz, not a bad thing in a crafting resume! 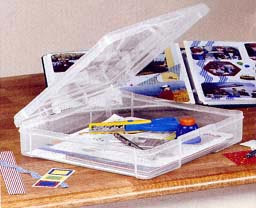 For those of you who are Quickutz fanatics here there is a very clever, although a little elaborate, way of storing your dies. As you may know collections of dies tend to grow over the time, but this system will allow you to keep track of all your dies using the Magpie Nesting Storage. With Quickutz dies you have a code in the die so Angela stores hers using this code. First, She got a Rollidex type of box and she used a card/s for a type of shape and then organize them alphabetically. That way if you are looking for a shape of a cherry you look under fruits. Angela either downloads the image from Quickutz website and then prints it -advantage: quicker- or she just die cuts it -advantage: you will have the exact size of the shape. Then Angela writes the number/code of the die and between brackets if its a single die (1) or a doublekutz (2). Then in each of the tins made for the Magpie unit, she stores the dies using the codes, in each tin you can fit up to 66 2x2" dies, so it's up to you and your collection of dies to divide them between the tins. Changing the tab is really easy, so in case that you get a few more in between you can always relabel the front of the tin. 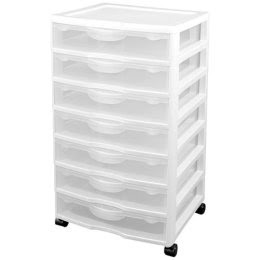 Samm husband did this acrylic storage. 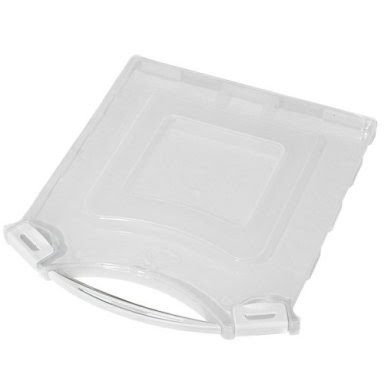 This is what Samm says about it:It's a store for my new acrylic stamps, it was made from a sheet of acrylic we had left over, so it was free too. It's great as it makes them very accessible.